StrikeAlert Personal Lightning Detector | OhGizmo! 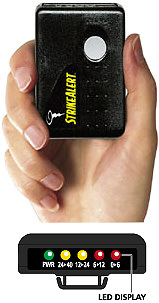 The StrikeAlert is a small pager-sized device that provides an early warning of approaching storms that are producing lightning. When there is a strike an audible alarm will sound and a series of colored LEDs will let you know the distance from as far away as 40 miles to within 6 miles. It can also let you know if the storm is getting closer, moving away or remaining stationary based on the detected lightning strikes. On 2 AA batteries the unit will run for about 100 hours which should get you through even the worst of storms. I was actually surprised to find that the estimated odds of being hit by lightning in a given year are as high as 1/400,000. All things considered though it’s still pretty rare and I don’t know if carrying around a lightning detector all day is really that necessary. Common sense should be more than enough to let you know if it’s time to put away the golf clubs and head inside when the weather turns nasty. The StrikeAlert is available on the Outdoors Technologies website for $79.99. Yeah, but if you’re out hiking or camping, I could see where this little thing might save your life.